Abbotsford – The 37th annual Abbotsford BerryFest is set to return for a “berry good time” on July 7th from 10 am to 10 pm to the streets of Essendene and Montrose Avenue in Downtown Abbotsford. 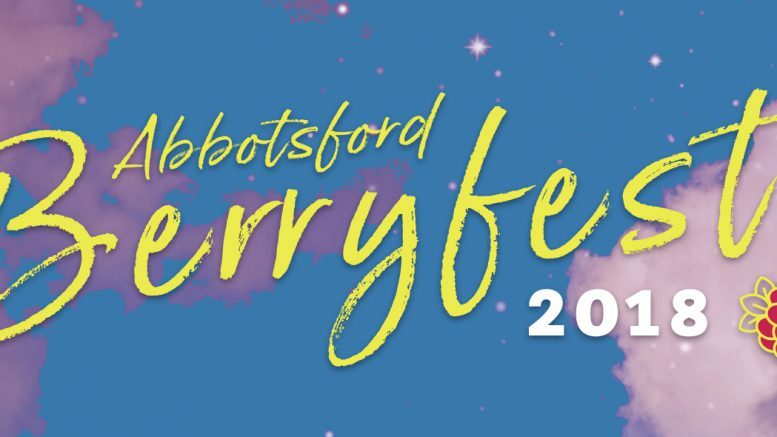 This year’s BerryFest is expected to attract more than 6,000 attendees for a fun-filled day of family-friendly festivities created to commemorate Abbotsford’s national distinction as the berry capital of Canada. The 2018 Abbotsford BerryFest will kick off with a welcome address by Mayor Braun followed by a BerryFest pie eating contest with several community participants including the Mayor. New this year, will be a gardening demonstration with master gardener, Brian Minter and a gardening TedTalk with Abbotsford’s Urban Gardener, Marina Gibson. The fair will also feature berry sales from Neufeld Farms and Lepp Farm Market, food trucks, a craft beer and wine garden, a vendor marketplace, roving entertainment, main stage entertainment, face painting, balloon twisting, games and several rides including a Ferris Wheel, Berry-Go-Round and Euro Bungee, plus so much more. Be the first to comment on "37th Abbotsford BerryFest – Saturday July 7th"